Fall Foliage. There are few things more beautiful than the fall colours of Central Ontario. Take in the view during a relaxing Sunday drive down country roads or from the bow of a boat while cruising the Trent Severn. Hiking Trails. In addition to driving or cruising, the area is blessed with an abundance of national parks and hiking trails that offer unparalleled views of fall foliage. Check out this great Fall Colour Report by Ontario Parks which maps and tracks the changing colours from park to park!– allowing you to plan your visits during peak viewing times. Bala Cranberry Festival. A known miracle of fall in Ontario is the cranberry! Or, veterans of this festival will likely argue that the miracle is in fact the cranberry & maple sausages— Yum! Take a tour of the marsh and witness the harvest yourself, followed by hot cranberry cider, live music and market strolling. This year’s festival takes place October 16th – 17th. Witches Walk. If you have yet to visit Severn Township’s Coldwater Village, a visit on any day to peruse the main street boutiques is a must! But once a year, the town pulls a late night and gets freaky and frequented by thousands of witches! Pull out your pointiest hat and practise your cackle for a night of spooky sights, treats, contests and special promotions at the local shops. October 21st 2015 6:00pm-9:00pm. Northern Lights . Yet another gift of fall! Aurora Borealis has a season of it’s own and October-November happen to be some of the best months to view this natural wonder! And the first tip for viewing the northern lights? Drive north! If you find your cottage is too affected by light pollution, try taking a short drive to more remote areas or better yet, visit Torrance Barrens Dark Sky Preserve. Pickerel (Walleye) Fishing. 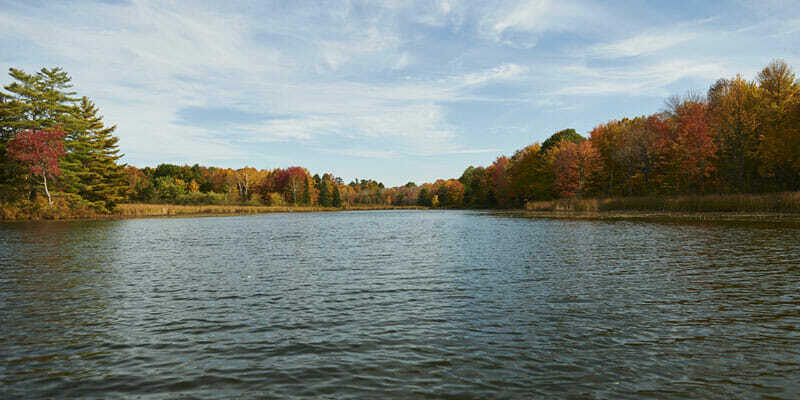 Next to spring, fall is considered by many anglers to be the best time for pickerel fishing. As lake temperatures cool, pickerel return to areas they frequented during spring. The fish will now be found in shallower waters than during the summer months; seeking a more comfortable climate and actively gorging on the influx of bait-fish. Food. Let’s not forget all the gorgeous food that comes with fall! Pumpkin pie, pumpkin spiced lattes, pumpkin soup – Okay, so maybe this section should be called “pumpkin”. Whether you’re a fan or not, ‘tis the season for cozying up with delicious comfort food. So wipe those summer-be-gone tears away, grab a hot cider and go out and enjoy this colourful season! For more information on what to do in the area or cottages for sale in the Georgian Bay and Muskoka area, please see our website www.georgianbaycottages.com or call 705-756-7629.